Discussion in 'Contrails and Chemtrails' started by Mick West, Dec 18, 2011. There's a theory out there that suggests that the long white trails left by aircraft are deliberately sprayed "chemtrails", and that this spray contains aluminum, and that this will make a lot of money for Monsanto, as they are patenting aluminum resistent genetically modified crops, and so will be able to control the food market. This is incorrect, for a number of reasons. "Chemtrails" themselves have been extensively debunked elsewhere, but let's look at this particular claim about aluminum resistent crops. Why is it wrong? It's not the aluminum that's the problem, it's the acid, which creates aluminum ions from naturally occurring aluminum compounds. Spraying aluminum or aluminum oxide will not increase the amount of aluminum ions. You'd need to spray acid. Spraying aluminum would not significantly increase the amount of aluminum in soil, as soil is about 7% aluminum naturally. Acid soils limit crop production on 0-40% of the world’s arable land and up to 70% of the world’s potentially arable land (Haug, 1983). 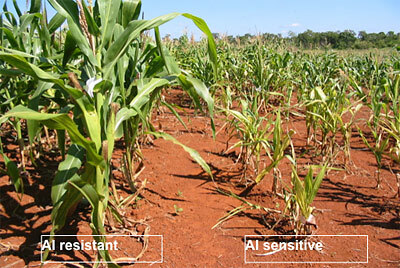 Although the poor fertility of acid soils is due to a combination of mineral toxicities (aluminum and manganese) and deficiencies (phosphorus, calcium, magnesium, and molybdenum), Aluminum toxicity is the single most important factor, being a major constraint for crop production on 67% of the total acid soil area. There are several estimates of the extent of acid soils in the world. 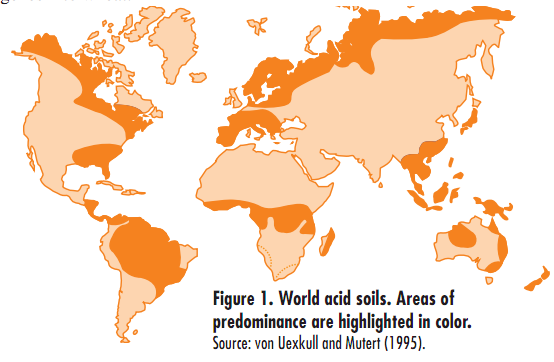 According to van Wambeke (1976), acid soils occupy 1,455 million ha (11%) of the world’s land, while Haug (1983) estimated that 30-40% of the world’s arable soils and up to 70% of potentially arable land are acidic. Even though spraying aluminum would not make much difference, consider just how much aluminum you'd need to spray to raise the amount of aluminum in the soil by 1%. Most of the world's production of Aluminum comes from bauxite. The total world production of bauxite is around 200 million tonnes per year. Bauxite is only about 50% aluminum by weight. Hence, to increase the aluminum content of US arable land by 1%, you would need to spray the equivalent of 40 years of the entire world's production of bauxite. And that's assuming you can somehow target just the arable land. That certainly does not seem to be the case with the reported "spray" patterns. Arable land is only about 20% of the total land area of the US. So you'd need around five times that much, or 200 years worth. Hopefully you can see what a none starter this idea is. You have to mine all the bauxite in the world for 200 years, then ship it all to the US, then spray it over the land, and you'd still only get a 1% increase in aluminum. Which would make no difference to aluminum toxicity, as that is caused by the acidity. Looking at Mick's world map above, you can see a vast region in Brazil which is affected by the acidity causing problems with aluminum in the soil. 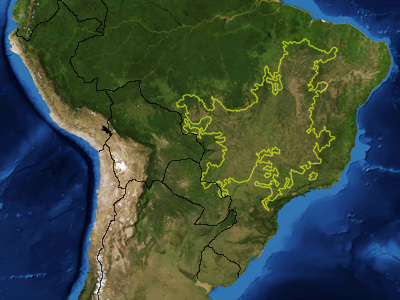 The frontier regions in Brazil are called "cerrados", meaning closed off wastelands, because the soils are very old, have high acidity, are low in nutrients, and have a big problem with aluminum toxicity. These deep sandy soils have sparse scrub savannah vegetation and are not rain forest areas. Rainfall varies from adequate to dry, but the sandy soils are underlain by an impermeable limestone which traps virtually all the rainfall with nearly no runoff, creating a shallow aquifer with annual recharge, excellent for irrigation. Due to the tropical climate, up to 3 crops per year are possible! The extent of the cerrados is 500 million acres, almost 1/4 of the country and almost equal to the US acreage east of the Mississippi, an area which actually surpasses the entire cropland resource of the United States! When the area was opened in the 1970's, no one knew how to farm it, so cattle ranching was the only option. Over time, the Brazilian government's agricultural research branch, EMBRAPA, has focused on learning how to grow crops on the cerrados. The process requires five or more years of consistent annual lime applications to reduce the soil acidity, an expensive prospect. One of their focuses is developing aluminum resistant crops. Can anyone imagine why aluminum resistant seeds are being developed, if only for this region? It is interesting that you do not deny monsanto is genetically modifying crops for this purpose. Growing crops in acid soils. Yes. As explained this would not be affected by spraying aluminum. I don't think anyone was suggesting that. This thread was just about debunking this particular aspect of the claim. vapour trail, also called Condensation Trail, or Contrail, streamer of cloud sometimes observed behind an airplane flying in clear, cold, humid air. It forms upon condensation of the water vapour produced by the combustion of fuel in the airplane engines. When the ambient relative humidity is high, the resulting ice-crystal plume may last for several hours. 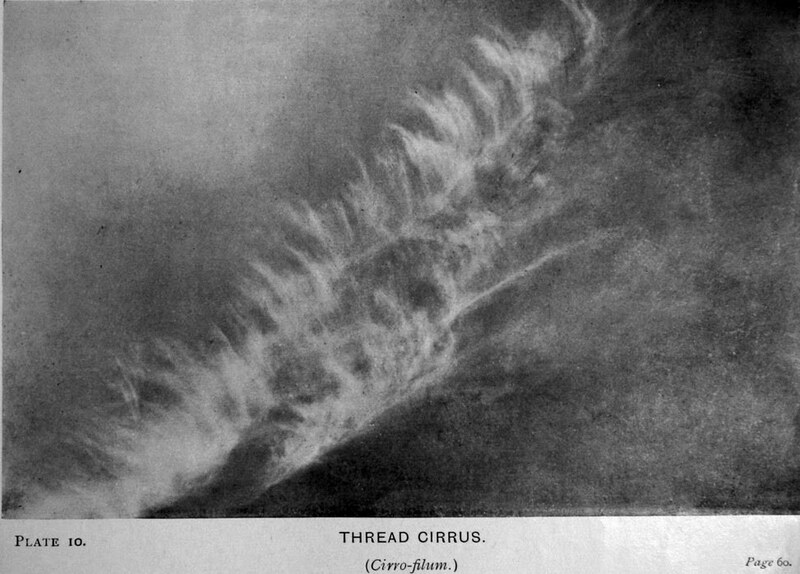 The trail may be distorted by the winds, and sometimes it spreads outwards to form a layer of cirrus cloud. That same definition is in the 1993 Encyclopedia. Actually, many countries are working on this. Why 'telling'? The map above shows the problem of soil acidity is worldwide, it has existed since before man began agriculture. Brazil has the means and good reason to use their land and they are determined to do so. No one here made that statement, but it has been made by chemtrails believers! You will find that we know more about the chemtrails hoax than you ever will. I, for instance, traced it back to its origins 15 years ago. Now, there you go revealing that you really don't have a clue. So do you think we are adding to the amount of Aluminum on the surface of the Earth? So you are allegating the USAF said contrails can not last more than 30 min? And you are admitting contrails can last hours? Would be nice if you chemtrailers could get your stories straight and have some coherency. And why be unregistered? On days like today? Here in Florida the chemtrail evangelists on youtube claim we were being sprayed. Weather service said we had a 120-130kt jetstream out of the west with the 250-300mb level pretty much saturated so we had filtered sun through a natural cirrus deck. Most air traffic was leaving trails when passing through this layer and when flying above it. The trails were generally above the jet stream since most of our traffic moves north-south and doesn't want to fly in that cross wind. The cool thing was that trails laid above and perpendicular to the jetstream moved VERY rapidly from west to east and were substantially sheered as well. Pretty neat watching the contrail cirrus get incorporated into the overall cover while I was out doing my workouts today. Will you educate yourself about general aviation and meteorology? I've not seen this. Do you have a valid source to back up this claim? I remember from my childhood "fishbone clouds". You people call these chemclouds these days. I've learned that they are highly sheered short contrails caused by aircraft ascending or descending through a layer where contrail formation is favored. They were common enough when I was little that I had a name for them but you claim that the Air Force prior to 10 years ago said such couldn't exist. Something isn't meshing up. How about tests showing 7 parts per billion in 2006 and now at 3450 parts per billion? Please keep up with the real facts. What tests? What were they testing? What for? Where? There have been many tests published by chemtrail theorists. All have been shows to have expectable levels of natural minerals. You would expect to find quite a range, based on location and sampling techniques. Mick? Really? How much did they pay you? I've noticed that on occasion de-bunkers aren't what they always appear to be and often cherry pick whatever happens to fit their or their employer's agenda; as an example, look at quackwatch.com for its pathetic summation of mercury, which quackwatch says is not something to be concerned about. I have asked multiple medical doctors, "does this particular vaccine contain mercury? ", and the majority of them deny that it does. I then tell them that it contains Thimerosal, which contains mercury. But as for chemtrails, I am no expert althought, there is a lot that needs some 'splainin'. Experts in a particular area generally only know what they know because that is what they are told. The experts are often not the types of minds who created the knowledge in the first place. I don't get paid anything. I'm just some guy. This is my hobby. So what is wrong? What is missing? What do you disagree with? This is incorrect, for a number of reasons. Forgive me if I jump right in the deep end, and tell you one good (actually bloody-orful) reason why the theory BEGINS to make a helluva lot of sense. In the areas where "They" are illegally and illicitly dumping chemicals (which by analysis include large proportions of aluminum) the aluminum content of the soil jumps by thousands of times. I CAN think of one Military-Industiral Complex Company which would benefit horrendously if they could only devise a way of dumping millions of tons of aluminum-resistent seeds onto farmers' markets.... especially if they back-up their military-marketing with carried-out threats of lawsuits to any farmer who grows one single ally-res plant on her back garden. If you want to hide in your Metabunker, be Their guest. Hi MikeR, I understand you were eager to reply, but if you read the rest of the post it explain why adding aluminum to the soil makes zero difference, as it's the acidity of the soil that is the problem. The purported analyses that have been put forward to date have been water samples with poorly controlled collection methodology and likely contamination by dust, which naturally contains aluminum. the aluminum content of the soil jumps by thousands of times. I haven't seen this demonstrated anywhere. Putting aluminum into well buffered soils would be terribly unproductive if they wish to create a need for aluminum resistent seeds. Additionally, wispy trails at 30,000 feet plus would be an absolutely silly means of delivering that aluminum to the soil as well. One, everybody could see it. Two, it wouldn't come down anywhere near where it was released. Most of the time our biggest contrail days over FL and the rest of the southeast comes when the westerly jet stream is brisk. Contrails are well out over the Atlantic in no time. Mike, can you show me the "analysis" you refer to? To Mick the writer of this, you say over and over again that it makes no difference when large amounts of aluminum is added to our soil, as there's already some aluminum in the soil anyway. I am here to tell you it does make a difference. If you don't believe me, go out and buy some aluminum, and put it in a pepper shaker, then every time you sit down to eat with your family, just like salt or pepper....just shake some into your food. When you give that to your kids to eat and tell me you have no concern for their health or any consequences because there's already some in the soil.....then you will be practicing what you preach. Then you will have an eyeful of what you are telling others to allow, ignore, coverup. This is what you want to accept. Whether government planes are your pepper shaker (which you appear to admit they are doing without our permission, you just say it isn't harmful) or you just shake it in there yourself, you and your family are still ingesting it (as are we) so have fun with that. The more you try to convince people to do nothing about it, the more people you are sealing everyone with harm. Nice work. I don't think that there's any evidence of anyone spraying aluminum. And it will not make a difference. Sure I would not want to sprinkle it on my food, but I would not want to sprinkle soil on my food either. Sprinkling a bit of aluminum oxide on soil will have about the same effect as sprinkling some soil on soil. The soil is ALREADY 8% aluminum, and it is not the amount of aluminum that the problem, it's the acid. For a start, where's the evidence that "large amounts of aluminum" is being added to the soil? Outside soils in Mt. Shasta area now have over 1.6 % or 16,000 mg/kg of aluminum. Soil is 13000 mg/kg in aluminum under my house, likely natural. That is the entire basis for this claim, one sentence on a website, no analysis, no lab report, nothing to back it up whatsoever. "As usual, you ignored our data. If you choose to ignore the data of many investigators, debunk a proven fact with only your opinion, and resort to abuse, I have no interest in you." How much aluminum would it take to increase the soil percentage from 1.3 to 1.6%? If evenly distributed in the top six inches of an 8,000 square foot lot, it would be about 1080 lb elemental aluminum, or 2,000 lb aluminum oxide. To spray at this rate over the entire United States would require 13.2 billion tons. This would require 325 million flights by tankers with a 40 ton capacity. First, according to The Engineering Toolbox, average soil weighs between 75 and 100 pounds per cubic foot, average of that is 87.5 lb/cu.ft. An average 1/4 acre city lot contains 10890 square feet. Subtracting a 2000 square foot house along with various appurtenances, sidewalks, patios and driveway from the lot leaves you with approximately 8000 square feet of soil surface, so I agree with Steve's figure of 8000 square feet. A block of soil 8000 square feet and six inches deep(1/2 foot) would contain 8000 sq.ft x 1/2 foot deep= 4000 cubic feet. 0.3 % of the total soil weight is .003 x 350,000 lbs =1050 lbs of elemental aluminum. So, my figures closely match Steve's results of 1080 lbs. However, as Steve notes, Mangels doesn't claim that elemental aluminum metal is being sprayed, he claims that aluminum oxide is being sprayed. Since aluminum oxide is a compound made up of aluminum and oxygen, some of the mass of that compound is elemental aluminum and some is elemental oxygen. Aluminum oxide contains 52.9250 % aluminum, along with 47.0750 % oxygen. So, in order to increase soil elemental aluminum content by 1050 lbs using aluminum oxide containing only 52.9250% elemental aluminum would require an addition of 1050 lbs aluminum oxide x 1/.529250 = 1983.939 lbs. of aluminum oxide. 1983 lbs /8000 sq. ft.= 0.2478 lbs per square feet. Is it even plausible that aircraft "spraying" from 30,000 feet coud place 1983 lbs. of aluminum oxide on Mangels city lot? The city of Mt. Shasta lies within Siskiyou county. The county contains 6,347 square miles, or 176,944,204,800 about 177 billion square feet. 176,944,204,800 square feet x .2478 lbs./sq. ft. = 43,846,773,949 lbs, or 21.92 million tons of aluminum oxide. Total world aluminum oxide production is approximately 45 million tons. It is not even plausible that nearly one half of total world production of aluminum oxide would have been applied in such a manner, over a single US county. Most likey, the difference between soil under Mangels house and soil outside in his yard is just due to differences in soil, perhaps the foundation was backfilled with a different soil, or soil was trucked in to fill his yard. Mike,your points are well taken regards unsubstantiated claims. Testing is expensive,so claims,rumors,speculations, cascade from one to another & build up to a frenzy & in some cases hysteria as in "the sky is falling". Personally,I can only rely on my senses & what they have recorded in my 60 yrs on this planet. I have seen contrails which have mostly been short white 'tails' that diminish quickly.I have never seen trails that last an entire day & expand to cause a massive haze in the sky until only recently. I have seen what I would describe as basket weaving from multiple aircraft trails flying simultaneously from various directions & very frequently. I find this unusual in the past 6 yrs,prox. Being that 'chemtrails' do not exist per gov't authorities,I must turn to other sources of info & research their claims. Documentaries such as "What in the world are they spraying", & soon to be released,"Why in the world are they spraying" are such resources. Again,I can only rely on my own experiences & restate that in my 60 yrs,I have never witnessed the unusual type of contrails that are occurring today & cannot explain it away by stating it is due to more air traffic. Can this now worldwide topic be explained by mass hysteria or as Carl Jung explained the UFO experience as "the projections of the collective unconscious". Author, Paul Schroeder, quotes Jung as stating, "to Jung, the global phenomenon of reported UFOs is a mere 'projection' of our unconscious desire; we 'create' an ersatz psychological substitute for God. We are still looking 'up'......". Medbear, when you project the chemtrals hoax, you are not at all dealing with a true religion. If anything, it is a demonstrably false belief system, just as your claims to have never personally seen a persistent contrail. I may have never personally experienced seeing a duckbill platypus, but there is ample evidence for them going back many years. For "chemtrails", there is no evidence presented anywhere, including the two cult movies you refer to. But let's just see how strong you really feel these movies amount to "info and research". Name the singlemost piece of information put out by the movie which you find unimpeachable, fact based, and provably true. Not a laundry list of "connections". One single piece. What would you personally choose if you had ten minutes of national airtime? If you can't name one, you have some hard thinking to do, and it should be a lesson to others. Personally,I can only rely on my senses & what they have recorded in my 60 yrs on this planet. I have seen contrails which have mostly been short white 'tails' that diminish quickly.I have never seen trails that last an entire day & expand to cause a massive haze in the sky until only recently. I have seen what I would describe as basket weaving from multiple aircraft trails flying simultaneously from various directions & very frequently. I find this unusual in the past 6 yrs,prox. [...] Again,I can only rely on my own experiences & restate that in my 60 yrs,I have never witnessed the unusual type of contrails that are occurring today & cannot explain it away by stating it is due to more air traffic. . This always amazes me, that people believe they did not see persistent contrails before. It's always difficult for people to accept that their personal recollections may be simply wrong or unreliable. Of course, I realize that chemtrails believers may say that my own, very clear recollections of seeing persistent contrails 30+ years ago are wrong. But that's why it makes sense to pay attention to the previous documentation of the time, which shows that persistent contrails were common and familiar sights, decades before believers claim the "spraying" began. Contrails, especially persistent ones, along with the cornucopia of different clouds I watched as a kid growing up in the 1970's is what sparked my interest to study aviation and meteorology. I also spent as much time as possible outside, much of it keenly observing nature, and every time I hear someone say they don't remember seeing persistent contrails I think of the kids in my neighborhood who spent most of their time indoors. Personally,I can only rely on my senses & what they have recorded in my 60 yrs on this planet. I have seen contrails which have mostly been short white 'tails' that diminish quickly.I have never seen trails that last an entire day & expand to cause a massive haze in the sky until only recently. I do not share this experience. I'm only 34 years old but I started noticing the broader world around me and taking a keen interest in weather and meteorology at about age 10. 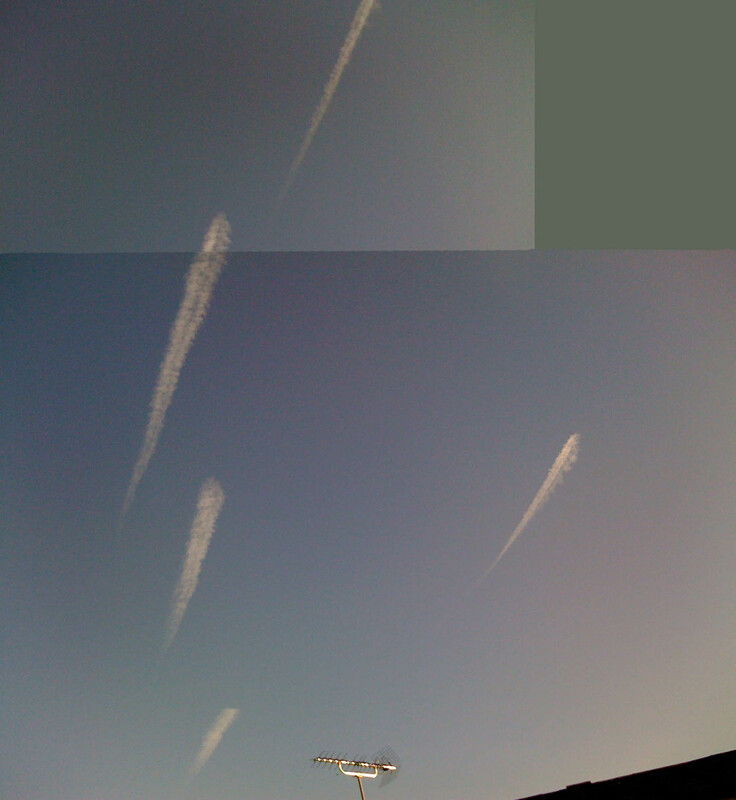 Persistant contrails and contrail cirrus have been common features all along. I remember noticing that the contrails differed in character by season and depending on the the weather within season. This has not changed. My annecdote of having been observant of persistent contrails along with other clouds is just that. So I look to literature and records prior going back to see if my memory is correct. Literature in the major meteorological journals seems to indicate that contrails have been viewed and studied for several decades now. I have seen what I would describe as basket weaving from multiple aircraft trails flying simultaneously from various directions & very frequently. Are you at all aware of the sheer volume of air traffic over the US? Monsanto is donating $5 million to farm communities stricken by drought. They didn't have to do this. The irrational hatred by chemmies when this corporation does good is displayed on Michael J. Murphy's Facebook page. Murphy falsely claims that Monsanto is involved in spraying aluminum worldwide to poison the soil, he also falsely claims that Monsanto has patented aluminum -resistant seeds to establish a monopoly after world soils are "poisoned" by aluminum. This claim is extremely irrational. Aluminum naturally makes up 8% of the soil crust. It is a physical impossibility to change that percentage for where would the aluminum required come from? To add aluminum to world soils one would have to first remove aluminum from world soils, then put it back! Michael J. Murphy and the other hoaxers will not address this question or encourage such logical thinking among their followers. Instead they want to maintain ther flock in an agitated fear-based emotional state spinning endlessly around in a whirlpool divorced from reason. I think MJM is reframing the Monsanto thing as "stress". i.e. Monstanto is creating "stress tolerant" crops, and chemtrails create stress because they create drought. Of course the aluminum meme lives on, but MJM realizes it is bogus and has quietly moved on. Of course there's no reason why anyone could possibly need stress tolerant crops, unless there's an illuminati plan to depopulate the planet. And that's the end game in his thought process. Only these new crops will grow in the high stress environment in the future, and Monsanto will control them, so all they have to do is cut them off, and 6.5 billion people will neatly be culled away. Such a simple plan! I don't think everyone who worries about Monsanto necessarily believes they are involved in some grand scheme to kill off 6.5 billion people. There are plenty of other good reasons to criticize that particular corporation. Also, to suggest that donating 5 million dollars is evidence of their true and philanthropic nature is naive. Environmental and social responsibility are expected of businesses these days, and they don't exactly have a squeaky-clean image. In my opinion such acts on their behalf are merely strategic PR stunts. "The government needs to learn from the hundreds of farmers who, right in the so-called suicide zones of Vidarbha, have initiated efforts for debt-free, low-cost, environment-friendly farming practices. If government policies also become favourable for such farmers, it won't be long before these villages get back their cheer and smiles." Biotech crops may seem like a good idea to some, but they certainly don't empower farmers in the global south. Higher priced seeds, requiring higher priced chemical inputs, and without the claimed increases in yield only result in more debt. Monsanto may not be banking on chemtrail-induced aluminum poisoning, but they are certainly banking on desperate farmers, on way or another. Don't worry too much about India having to buy biotech from Monsanto forever. The Indian people have a huge resource of well trained scientists, and are rapidly developing their own biotech industry. This is already happening in pharmaceutials. One of their biggest problems is that many of the best India-born scientists currently work at US universities, just look at the faculty list of any school here. I fully expect that the bulk of world biotech seed production will eventually be dominated by asian countries, with the US companies finding their forte in niche development of more novel traits. Monsanto isn't the only biotech company in the world - there are massive projects in Europe, India & china & Sth America looking at engineering staples such as beans and rice that will be as important, if not more-so, than Monsanto's efforts to sell Roundup et al. A good discussion of this is found at http://www.michaeleisen.org/blog/?p=1135, in the comments section. When you got sucked in, what part did you find to be the most convincing? Most likely it has been looked at and debunked already. The video "why in the world are they spraying" the second part to "what" - the most intriguing thing to me was where plants were dying only meters away from the same plants which were healthy and then people doing tests on the soil finding unusual levels of aluminum and barium etc. Further searching at the time i found that this was occurring a lot (from reports of Chemtrail believers), but from what you've stated levels of this metal isn't actually unusual then the plants suddenly dying alone isn't any argument. But it's still interesting. I also had a thought why haven't chemtrail believers linked bee's dying on mass? could easily test collapsed colony's for unusual levels of metal and bee hives would naturally accumulate huge amounts of the stuff - If it was happening, and they weren't I'd be amazed. I'll try to dig out the stuff but as you say it looks like you've de-bunked a lot of it effectively, as with anything like this i find the idea very possible (why i was sucked in) but the weight of the arguments by them are recycled disinformation. ^ I was previously unregistered, sorry my replys unclear, i'm getting pestered by gf to make dinner and playing poker lol. I also had a thought why haven't chemtrail believers linked bee's dying on mass? There are simpler ways to avoid drought than going to genetically modified seeds. This article lists five open-pollinated crops that are natually drought resistant: sorghum, millet, garbanzo beans, pigeon peas, and peanuts. The video "why in the world are they spraying" the second part to "what" - the most intriguing thing to me was where plants were dying only meters away from the same plants which were healthy. That doesn't even make sense, though. If you sprayed something from the air, its not going to kill one plant and leave another green and healthy a few feet away. Michael J, Murphy takes his believers to be fools, which some of them evidently are. In his first movie, he and Dane Wigington are seen next to a koi pond speaking about how toxic and full of poison the water is. If you look closely, you can see the lab report they show, though, is an analysis of sludge (soil) from the bottom of a pond, not an analysis of water! A few seconds after they show healthy koi fish several years old swimming peacefully in the ""toxic" and "poisoned" water. If the water were so toxic, how have the fish survived? I'll bet you the fish are still there, happily swimming, two years later. Michael J. Murphy took people like a bunch of lambs to slaughter, he was mocking them by using that clip, laughing at how no one would catch on.